Who would have thought you could pack an Indian lunch buffet into a tamale? Or a Sonoran hot dog? Or an entire thanksgiving feast? 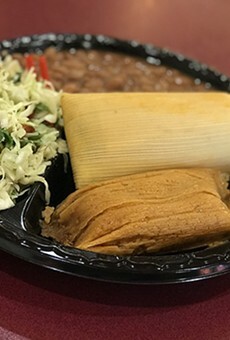 The gang at Tucson Tamale Company figured how to reinvent the tamale and we are eternally grateful for the line of exotic, healthy tamales they dish up. And they do a pretty darn good job on the old traditional favorites like green corn and red chile. Thanks to relatively new locations on the northwest and northeast sides, they're may be a lot closer to your neighborhood than theoriginal spot at Broadway and Tucson. Bonus points: If you're thinking about sending a taste of Tucson to someone, they send out care packages, too.